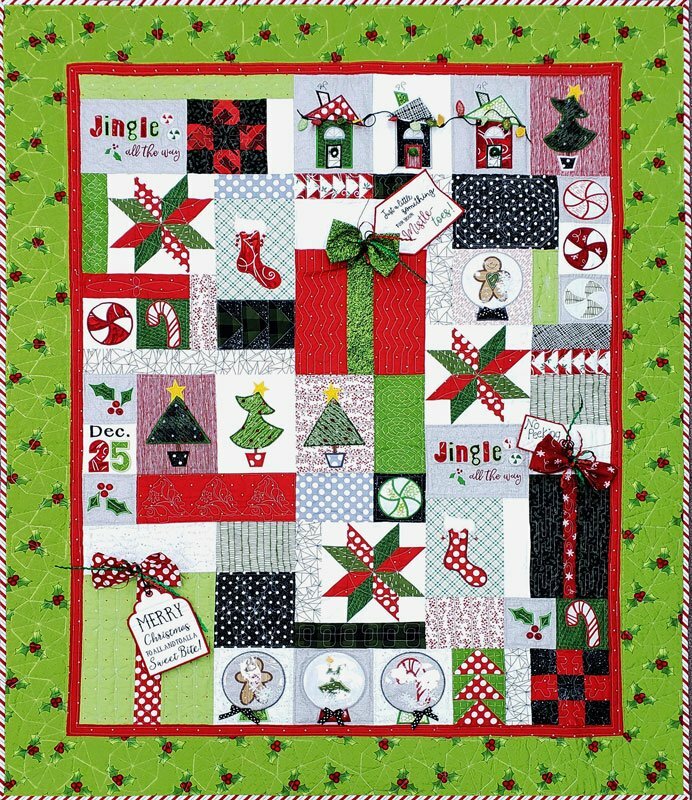 “Jingle All The Way” is a patchwork quilt of Christmas surprises with more than a dozen machine embroidered designs and new techniques like chenille trees and traditional quilt blocks. The multi-format embroidery CD includes all the applique designs in the quilt, plus 2 additional sizes for each design, and SVG files for electronic cutting! Miniature fringe wreaths and mylar lights adorn the row of houses and the vinyl applique makes the snow globes appear real. The festive flying geese strips are also pieced-in-the-hoop! Dimensional gift tags, ribbon, and button embellishments make the quilt even more merry! Make your own fabric choices and sew along with Susan. Bring your embroidery machines to class for this hands-on BOM class. Students must have completed their embroidery machine guide lessons. Class registration is $50 plus the monthly $30 charge.